Macaroni pudding is a classic dish from my childhood. It's basically cooked macaroni in an egg custard - a crustless quiche with pasta, if you so will. I like to add smoked ham, or bacon, and my husband prefers sliced up hot dogs. We usually add both. You can make it with cheese, or not - I like it both ways. I decided to add in broccoli last time I made this, and that was indeed delicious - and as a bonus, more nutritious. Boil the macaroni in salted water, a minute or so shorter than the instructions say. Whisk together eggs, milk, cream, a little salt and a pinch of ground white pepper. You'll get a lot of salt from the hot dogs, ham and cheese, so go lightly on the salt. Fry the sausage slices for a few minutes and set aside. Fry the onions and broccoli on medium heat for a few minutes, to soften. Mix with the hot dogs, the ham, the macaroni and the egg mixture. Add half the cheese. Pour everything into a buttered casserole, and top with the remaining cheese. Bake at 200°C for about 25 minutes. 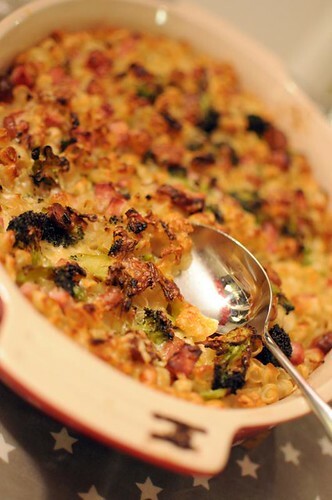 Anne, this is such a tempting dish, love its creaminess and the addition of broccoli makes it perfect! I'm actually commenting to tell you how cute the dish you baked that in is. :) And the pudding is an awesome idea to boot. Thanks Maggie! It's a Le Creuset, one of my favorites!